I wonder-have those words ever been uttered in the history of human language? It definitely fit the occasion while visiting my friend's mom in the hospital last week. 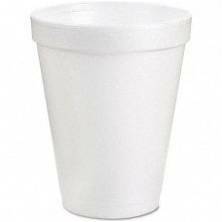 I noticed she had empty small foam cups on her bedside table. She appeared to be thirsty from the dry hospital environment, this coupled with oxygen, gave her dry lips and a thirst for water. I asked her if this, pointing to the small empty cup, was what they were giving her. She replied "Yes, they ran out of large cups". I was flabbergasted. I continued to ask how that could happen as if she would actually be able to answer. We then talked about our previous experiences and how, generally, you are given a water pitcher so you have access to more than a small cup of water. Is water even important? YES, especially when we are in the hospital. A previous blog entry offers the following:"We depend on water to flush out toxins in our bodies, keep natural bodily reactions going, and as a temperature regulator." Patients should have an ample supply of water within reach at all times. To have anything less than this is unacceptable.